Start by preparing the rice krispie treats. (Instructions at the end of this post.) Once those are ready, move on to the super easy frosting! You won’t believe the simplicity of the frosting, and you don’t need any special tools. Place one cup of any flavor chips into a plastic bag. Microwave unsealed bag up to one minute. Carefully hold the bag above the chocolate with two hands. (Caution! The chocolate will be hot.) While your bottom hand slides down toward the chocolate, gently pull up with your top hand. The chocolate should flow slowly out of the hole. Draw designs on your treats, and repeat with another flavor/color of chips. Optional: Add sprinkles before the chocolate hardens. How easy was that? And don’t they look way cuter than the store version? 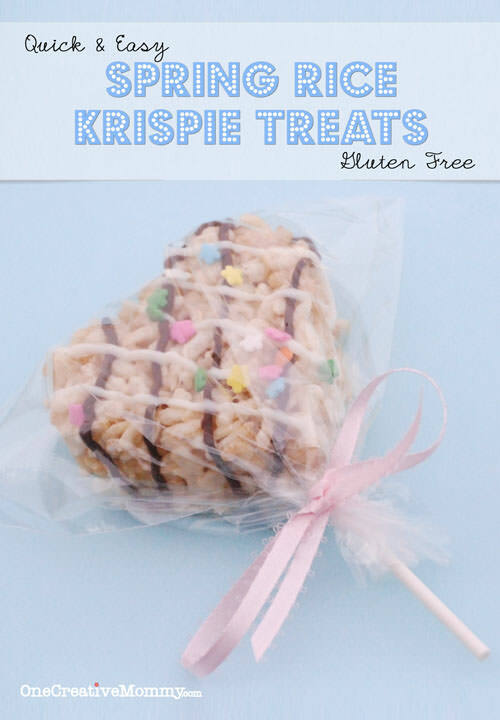 Begin with the basic Rice Krispie Treat recipe. I bet that many of you know it by heart! Hint–If you will be using a mold like I did, I suggest preparing only half of the recipe at a time. It gives you more time to mold the shapes before the marshmallows begin to harden. If you plan just to cut the treats into shapes, go ahead and make the full recipe. Melt the butter over low heat, and add the marshmallows. Remove from heat and add rice krispies. Stir gently until completely blended. Empty the molds onto waxed paper. Pour mixture into a 9×12 baking dish. Place the shapes on waxed paper. To make treat pops, place the treats in the fridge or freezer to harden, and then insert a lollipop stick into the base of each treat. Great treats in less than a half an hour. It doesn’t get much easier! Click here to learn my Frugal Treat Packaging Trick. Thanks for stopping by! While you’re here, check out some of my other Spring posts. Hi Heidi! These look delicious and so cute. I love that they are gluten free as I’ve been looking for those kind of recipes. Thanks so much for sharing with Transformed Tuesday. So cute! Thanks so much for sharing this on Waste Not Want Not Wednesday, Heidi, I’ve pinned it. Thanks for the tips! I never would have thought about melting the chips in a plastic bag. Great idea! You’re welcome, Michelle. Can you believe it’s that easy? Oooh these are perfect for Spring! Thanks for linking up with Hump Day Happenings. You have been pinned! See you next week. Thanks for coming to Hump Day Happenings! These are so cute, Heidi! 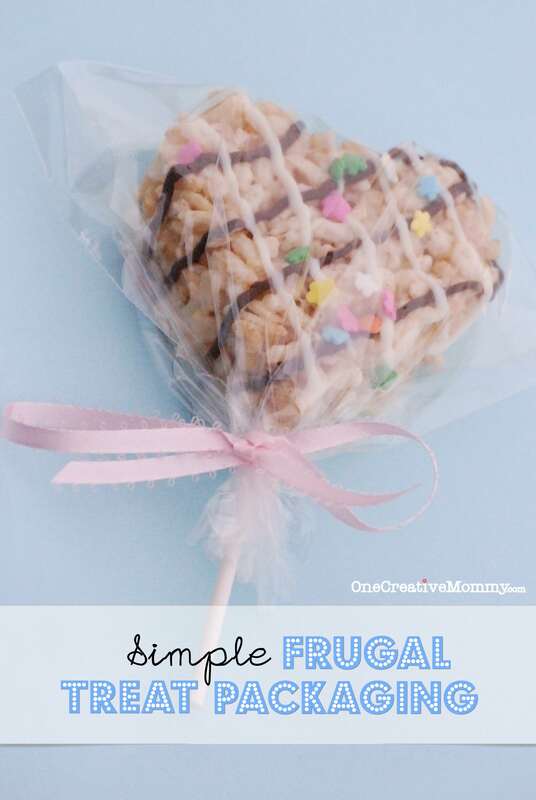 I thought the idea of store bought Rice Krispie treats was great – until I tried one. YUCK! I really should try and make some at home – especially as I can adapt your recipe to be dairy free. I’ll add this to my Evernote list of recipes and pin it too! Thanks so much Clare. I hope you can find something to replace the butter to make it dairy free! What a cute idea! These are great for school parties! Thanks, Christina. Those would be fun for school parties. Careful, though. Some schools won’t let your bring homemade food anymore. Isn’t that sad? These look better than the ones we get in Walt Disney World! Really, Heather? What a nice thing to say! Thanks! These are adorable. I love the packaging. Thanks, Candi. Would you believe that the packaging is a regular old fold-top baggie with the fold cut off? 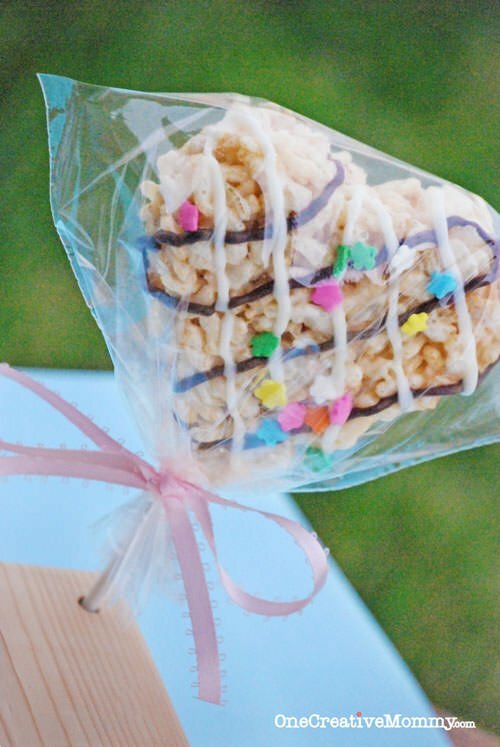 What a fun way to enjoy rice krispy treats! Thanks, Marilyn. It’s fun how something so simple and ordinary can turn into something kind of special. These look so great. I absolutely love your easy frosting tip, thankyou! Thanks, Katie. Isn’t it funny how something that looks so hard can turn out to be so easy?